This January and February, we’ll be finishing up our look at the second season of Star Trek: The Next Generation and moving on to the third year of the show, both recently and lovingly remastered for high definition. Check back daily for the latest review. We’ll be supplementing our coverage of the episodes with some additional materials – mainly novels and comics and films. This is one such entry. One of the more interesting things about the expanded Star Trek universe is the diversity. It is possible for supporting characters and guest stars to carry their own narratives and stories within the grand sweeping tapestry of the Star Trek universe. 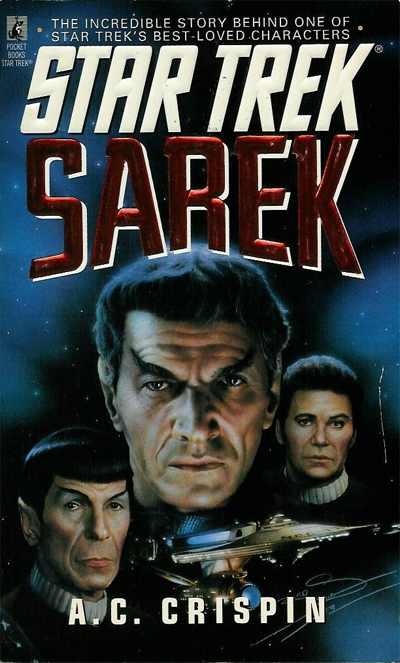 Despite his importance to the mythos, Mark Lenard’s Sarek only made a handful of appearances across the history of the franchise. He only appeared once in the entire classic Star Trek television show, in Journey to Babel. It is a testament to Mark Lenard’s dramatic abilities and D.C. Fontana’s writing that Sarek would recur across Star Trek: The Animated Series, Star Trek: The Next Generation and even the original Star Trek movies. The character – despite only appearing in a supporting role across four televised episodes and four feature films – remains one of the most intriguing supporting characters across the franchise. A.C. Crispin’s Sarek offers a fascinating glimpse at one of the show’s most compelling guest stars, even if the novel does suffer a bit trying to “fix” some of the problems that the author seems to see in Star Trek VI: The Undiscovered Country.